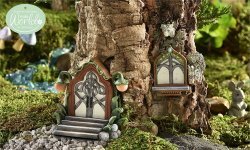 Set of 2 Mini World Glow-in-the-Dark Door and Window Design Accessory. Ornate textural and floral detailing. Halloween Punch Bowl and Cups with punch.